Waiting Women - Silvia Gonzalez S.
Comedy 9F, 2M unit Full lengthPearl Hart recounts her life as the notorious ‘Bandit Girl’ in the style of a Wild West Show. True accounts. Buffalo Bill’s Wild West Show is the platform where the notorious Pearl Hart begins to tell of her magnificent life as the ‘Bandit girl.’ She takes us through her earlier life as a miner, and to a stage coach robbery she herself planned which resulted in an unbelievable celebrity trial. She’s then confined to the Yuma Territorial Prison with cell mates of color. While in prison, she is constantly pursued by newspaper reporters who give her fine things for photograph opportunities. Pearl’s many liberties in the prison creates havoc. Also creating havoc is that Manuela, another cell mate, came to prison pregnant. The townspeople do their best to get Manuela a pardon, but they fail in the attempt. A baby is then born in the prison. Pearl suspects Manuela’s lack of release was due to racism. This play is a whirl wind of fun and actual portrayals of women of the west. 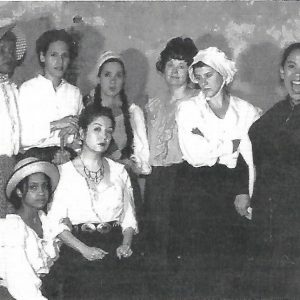 World Premiere at Mutt Repp May 1997, workshop production at Chicago Dramatists, Texas Hispanic playwrights Festival.